Showing 19 articles from March 29, 2016. On Saturday March 19, Aberdeen Police Officers responded to a call from Duffy's restaurant on Simpson Avenue. Emergency measures are being taken to inspect the progressing erosion of the shoreline near the North Jetty in Ocean Shores. Recent storms alone have shaved off up to fifteen feet of the hillside closest to a house on Ocean Shores Boulevard. The residents at Harvard Apartments in Aberdeen cite that the apartments are filled with pests like cockroaches, and the apartments have also been without running water for about a week. The residents have been given notices to leave by the end of the month. The notices were served on February 17. The Washington State Liquor and Cannabis Board has revised draft rule language regarding marijuana legislation. The new rules will be heard in a public hearing on May 4 and the rules will be adopted on May 18 if there are no disputes. On Wednesday, March 23 a log truck caught fire on Camp Creek Road in Montesano. Fire District 2 reported that responders arrived to aid the vehicle at about 3:20am. The fire from the truck neared other structures but was successfully knocked down to keep the fire from spreading. The fire crews were on the scene until 4:45am, the cause of the fire is still under investigation. A round of phone scammers are targeting the Grays Harbor County area again. The district court has received numerous calls from citizens who have received calls or emails claiming to be from the county and also claiming that they owed money. Courts do not call and request payments or card information ever. Clam diggers had a green light to dig razor clams March 25-27 at Mocrocks Beach on Washington's coast after marine toxin tests showed the clams there are safe to eat. The Bernie Sanders campaign has begun to pick up more momentum having won 5 out of the 6 western states in landslide victories. In Alaska, Sanders won 81.9% of the vote while picking up 13 of the 16 delegates. 69.8% of Hawaiian Democrats went for Sanders who earned 17 of the 25 delegates from the islands. Born in Italy, raised in Canada, with advanced music degrees from the U.S., Mario Cianflone is an acclaimed accordionist and music educator. 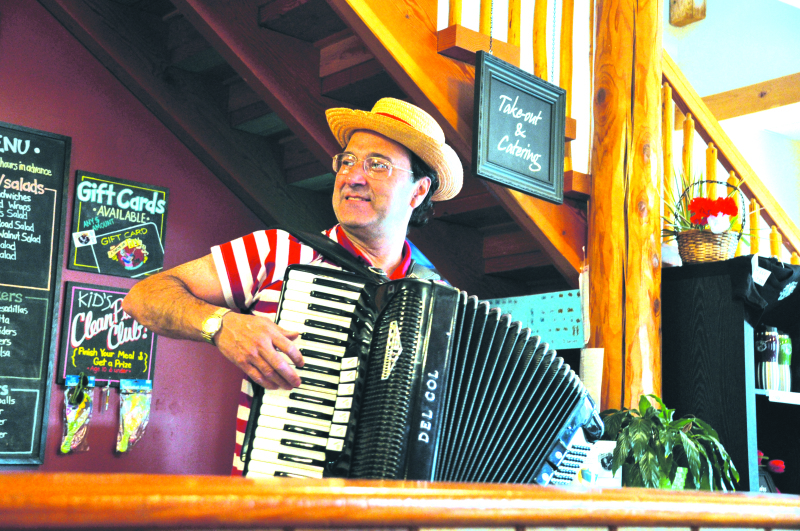 He will perform music from many countries and in many styles at the Vernetta Smith Chehalis Timberland Library on Saturday, April 2 from noon to 1 p.m.
At 6:00 on Monday the 21st, the Toledo city council meeting commenced. Councilman Guy Spratt motioned to accept the agenda and Carol Hill seconded it. The council moved to the department reports starting with public works. Craig McCown spoke positively of the water system and said the treatment plant is running fine. After his remarks, Police Chief John Brockmueller spoke about the police business. He said in Toledo there were 41 calls to service with 12 being repeat calls for one person. Other than the higher numbers over the last two weeks, he said the department has been running smoothly and noted the good work by his officers. Photo by Josie Bowen - Gustavo Barragan of United taking control of a ball played to him. 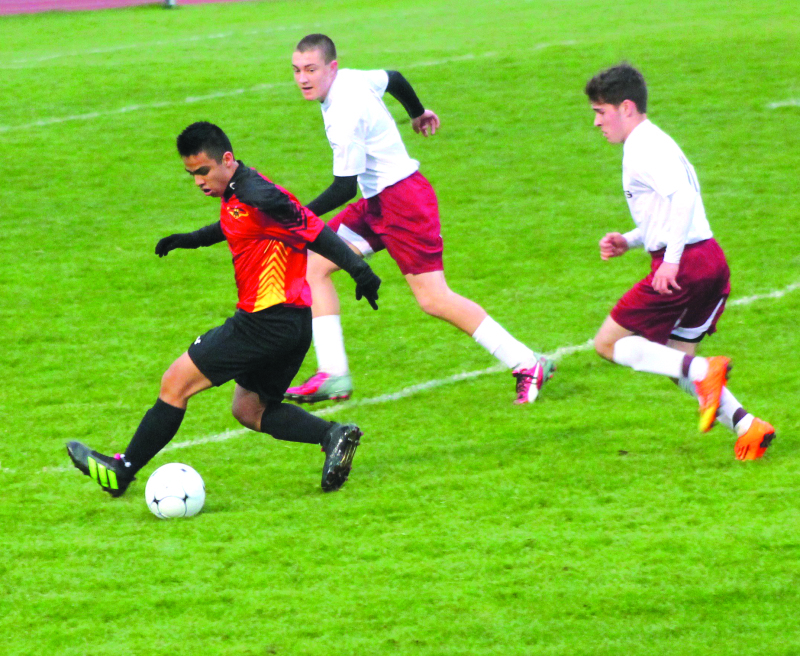 Barragan had three assists in the win over WF West. United continued improving and took a road victory at 2A WF West by a score of 5-2 on Marych 24. During the third week of February, Rachel Archer earned this prestigious title as an All-American by placing 5th place at Nationals. She wrestled in the 116 pound weight classification. Pictured is Jace Duckworth and Renan Campos of "D3," making a pitch to local business woman Trish Bisbee. The company produced a pair of glasses that do just about anything, according to the salesman. The buzz in downtown Raymond last weekend was the annual Business Week, which brings the juniors from all three high schools together. 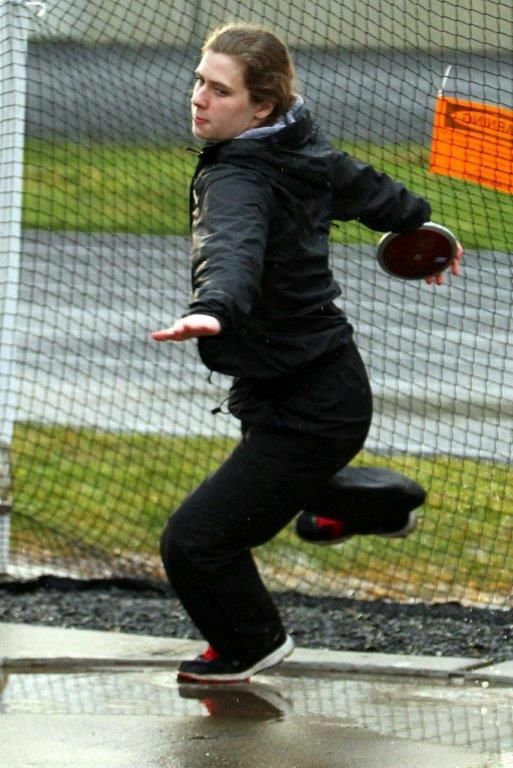 Photo by Larry Bale - Raymond's Karlee Freeman warms up for a great day at the discus ring and on the track. Please see sports pages for details. 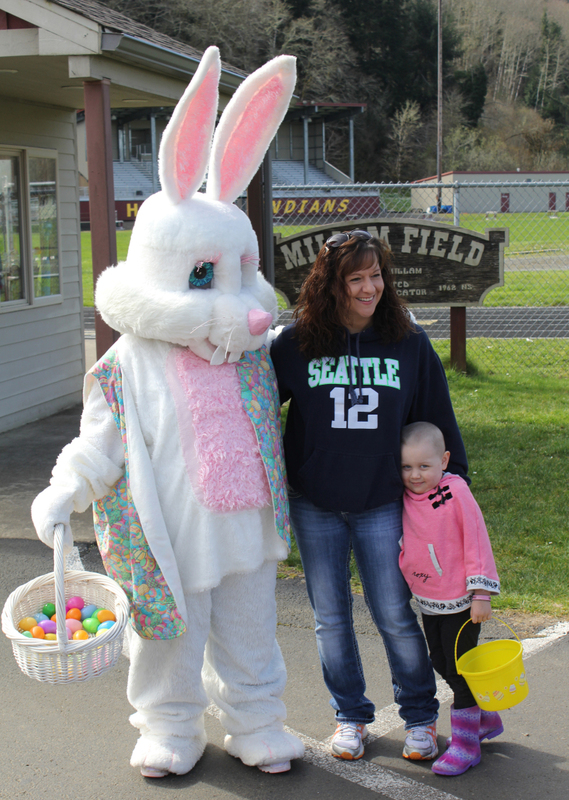 Photo by Patrick L. Myers - The Easter bunny showed up at the South Bend Easter egg hunt on Saturday, March 26. Easter is a time when the kids look forward to the annual Easter Egg Hunt in South Bend and Raymond. Clam diggers have a green light to dig razor clams in Long Beach, which is currently open to digging through Thursday. Photo by Patrick L. Myers - The Mission Creek Crew is geared up and ready to go to Peru. The Mission Creek Christian School is getting geared up for another mission trip to Peru. The school staff this time are leading an expedition to Iquitos, Peru with a team of 19 individuals, staff and students as well as student-parents are leaving to begin their journey to Peru on Monday, April 4. Michael D. Warner, 36, of Long Beach, was sentenced to five years in prison for possession of methamphetamine with intent to deliver.